Another measles outbreak made the news this week as nearly fifty cases (so far) were counted after an outbreak began at Disneyland in California. Even though “patient zero” – the individual who was the source of the outbreak – has yet to be identified, the usual scare-mongering was in force with grim reminders of deaths from measles: 123 to be exact, in the US, over a three year period from 1989-1991. What we never learn is whether these deaths happened in vaccinated or unvaccinated children, or what background health problems or nutrition deficits they may have had to make them vulnerable. We don’t know if patient zero was vaccinated, but odds are strong that s/he was – see below. We are simply (mis)led to believe that because somebody wasn’t vaccinated, somebody died, or will die. The “anti-vaccine movement” is blamed, again. • Deaths from measles in the US dramatically dropped to fewer than 2 per 100,000 by 1945 (see page 93 here), nearly twenty years before a vaccine existed. • Measles vaccine has been failing since the early 1980’s, with dramatic outbreaks spreading through fully vaccinated populations. Despite this investigation being published by the CDC itself, media outlets today keep telling us that this only happens because of people who don’t vaccinate. Earlier this year, even Science Magazine made this very gaff, with a headline so dramatically wrong it’s almost comical: “Measles Outbreak Traced To Vaccinated Person For First Time “. Even though these periodic outbreaks continue despite nearly every child in the US getting MMR shots, the CDC, your pediatrician, school principal, neighbor, auntie, and everyone else will tell you it’s your fault there’s an outbreak, if your child didn’t get an MMR shot. Even if your child is well while all the vaccinated kids are getting sick with measles, they will still believe this to be true and will still blame you for it. That’s when you might whip out this pearl: “This outbreak demonstrates that transmission of measles can occur within a school population with a documented immunization level of 100%” (see 1980’s link above). There you have it: Every kid in the school where this outbreak occurred had been fully immunized. Every. Single. One. And this is not an unusual scenario. If that doesn’t seem crazy enough, here’s how the CDC explained this disconcerting fail of MMR vaccine, in the carefully investigated and documented 1983 outbreak: “…this outbreak may have resulted from chance clustering of otherwise randomly distributed vaccine failures in the community.” Of course, this missive wraps the topic by saying it’s important to get vaccinated. Meanwhile, acquiring measles infection from vaccination itself has been documented. Obviously, MMR vaccination is not eradicating measles. It may even be spreading measles. And risks from this vaccine are real. Personally, I have worked with many families who are certain that the descent into autism that their children experienced was due to an MMR shot. Reviewing their medical charts carefully, I can’t disagree. What’s a parent to do? This is a huge topic, and I can’t begin to tackle it in a single blog. 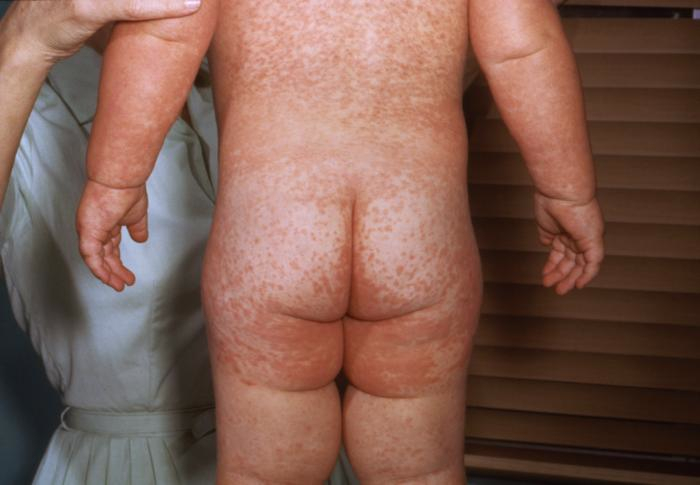 For more on why measles vaccines may be failing us more than we know, start here. Still, I would say this: Fear not. My siblings and I grew up in the era when your pediatrician was worried if you didn’t get measles, not the other way around. Measles, chickenpox, and mumps infections were regarded as beneficial childhood milestones that developed a vigorous, healthy immune system. Measles infection was so benign for healthy children that our lexicon created the word “measly” from it – meaning, insignificant, or “contemptibly small“. How times have changed! Pediatricians today who are under forty years old may never have seen a healthy child with measles in the flesh, and may be ill-prepared to nurture and nourish that child through it. – Measles infection and measles vaccination as MMR both present vigorous demands for the immune system. Your child’s nutrition status before, during, and after exposure can determine the severity of illness/reaction and whether or not there are complications. While sick with measles, your child probably won’t feel like eating, will have a fever, and may have diarrhea. Measles exposure (natural or injected) triggers changes in gut tissue and immune function, causing children to lose protein in stool during this illness, when the immune system most needs it. Replenish your child daily with good food during this infection. If they feel too nauseous to eat, feed organic beef broth or bone broths that are not low sodium – your child needs electrolytes here. Stir a half teaspoon of ghee or grass fed butter (a vitamin A source) into the broth. Give electrolyte drinks and any protein rich foods they will accept. Lactose intolerance is a documented effect for some children exposed to measles, so if dairy foods that your child usually loves suddenly feel awful during this illness, switch to non-dairy protein sources like egg, meats, chicken, homemade broths, or any tolerated legumes/beans/peas. Elemental amino acid formulas and supplements are available too. Contact me if you need more information on these products. – Your child’s weight relative to his height should be in a healthy range. Body mass index should be above 10th percentile. Underweight children, especially those with a body mass index or weight-to-height ratio below the fifth percentile, are at higher risk for infection in general and for more complications from infections. Though we often hear about childhood obesity in the US, most children in my practice are struggling with gaining weight and growing – and these are kids who get sick more often, stay sick longer, and have more complications. – Iron status should be robust. The best way to measure this is to check a child’s ferritin level. It should be at least 30, though reference ranges drop to 10. Signs of weak iron status include pallor, veins visible through skin, shiners at eyes, penchant for chewing ice or other non-food items (sticks, rocks, sand, pens, paperclips, fabric), fatigue, intermittent hyperactivity, depression or mood swings, or poor sleep. Teen girls may have heavier menses when iron deficient. Iron is the single most commonly deficient nutrient world wide, including in US children. – Vitamins A and C should be strong in your child’s diet every day. These are specifically protective for measles virus and will be depleted by the demands made on the immune system if your child is exposed. Cod liver oil, whole milk or butter, brightly colored vegetables and fruits are all good sources, and can add omega 3 fats also, which help modulate immune function. – Zinc status should be strong. Eat zinc rich foods daily – raw cashews, nut butters, pumpkin or sunflower seeds, pork, lamb, beef, mushrooms, or legumes and beans are good sources. You can also use a supplement to 15-30 mg daily for children in most cases. – Give your child strong protein status so his immune system has the building blocks needed to make globulins and other immune molecules to mount a defense. Your child should be eating at least 35-60 grams protein daily depending on age, from varied sources (that is, not just milk, cheese, and yogurt – see my blog on dairy addiction if that is your kid). The role of nutrition in preventing measles and lessening the impact of this infection is legendary in public health circles, and has filled volumes for decades – from vitamin A status as a predictor of measles deaths, to how fish oils modulate certain immune proteins in our bodies. Your child can have marginal status for any of these nutrition factors without your pediatrician’s notice – a scenario I routinely find in my pediatric nutrition practice. Pediatricians have little training in applied nutrition, and even less time to use it in clinic, where they must turn over dozens of patient visits per day. If you’re not sure what your child needs to build strong immunity, contact me for an appointment.